The Family and Child Education (FACE) program has served over 48,000 adults and children since 1990 to prepare them for school entry. 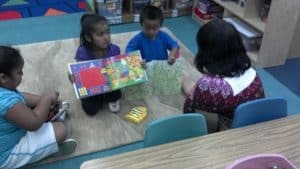 Preparing preschoolers for kindergarten is of prime concern to the Bureau of Indian Education. The outcome is school readiness, so that children come to school ready to learn in standards-based kindergarten classrooms. FACE has shown evidence-based outcomes for preschool children, ages three and four years, within a curriculum approach that is developmentally appropriate, incorporates active learning, and includes evidence-based teaching strategies–particularly in the areas of language/literacy learning and mathematics. The approach used in FACE is the National Center for Families Learning’s (NCFL) CIRCLE: A Developmentally Appropriate Preschool Model. 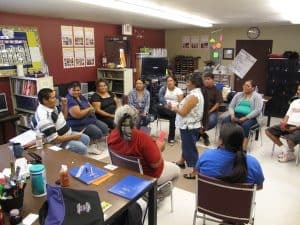 Parents learn how to help their children in school. Lessons are often designed to develop knowledge of native culture and language. 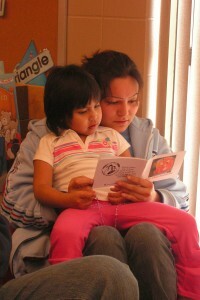 They gain knowledge about effective family life, child development and how to help their family be healthy. 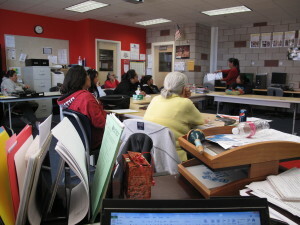 Parents learn about other services offered throughout the community that can help them achieve their goals. Parents and children work and play together in the children’s classroom. The parents support and participate in their children’s play. They learn how their children are growing and developing through observation. Parents see how their children learn best and are able to work with them effectively. The teachers are present to provide support and demonstrate effective teaching strategies. The teachers also model reading strategies for parents, and provide ideas that will help children learn at home.